Akira Kurosawa’s Seven Samurai (1954) is an epic in every sense of the word: ‘a long poem, typically one derived from ancient oral tradition, narrating the deeds and adventures of heroic or legendary figures or the history of a nation.’ Defining Kurosawa’s seminal work, which runs for three hours and twenty seven minutes, as a long poem is justifiable given the film’s length, the grandeur and scope of its ambition, and the descriptive beauty of its dialogue and imagery. The ancient oral tradition of the samurai and the Bushido code (meaning “Way of the Warrior”) by which they lived, depicted amid vicious civil war in the early sixteenth century period setting of the film, was past down from one generation to the next until the mid-twentieth century when the turbulence of World War II threatened its existence. It was in that climate of uncertainty, post-war shame and fear (referred to as the kyodatsu condition) in the years following the American Occupation of his nation that Kurosawa used the allegorical plot of Seven Samurai to reflect upon 1950s Japanese society. As such, he used the history of a nation to comment on its present. This style of film is known as jidaigeki. Without the honourable guiding influence of the samurai, Japan seemed to lose its way. In the wake of an atomic bomb, defeat and surrender, could there be any hope for the future? The heroic figures that embody the themes of this epic poem are seven ronin – masterless samurai – and it is through their deeds and adventures that Kurosawa weaves his tale. The film’s storyline is surprisingly straightforward. A poor farming village is “crushed under the heel of cruel bandits” who threaten to raid their supplies (and daughters?) during the harsh times of civil war. Spared an attack only until the rice harvest, the lowly farmers are terrified and desperate but vow to repel any further attacks on their livelihood and families. Unable to protect themselves, an elder proclaims that they hire samurai to defend the village. They should be hungry samurai, not proud ones, as all they will be offered in way of recompense is bed and board – no money or glory will come their way, only the excitement of battle. This excitement is reward enough for the selfless, principled warriors they recruit, with the help of experienced ronin Kambei (Takashi Shimura) who, although tired of fighting, says with a wry smile that it might be fun. Fortifications are set to repel the bandits. The village’s would-be saviours receive no fanfare upon arrival to the village. They are instead welcomed “like a plague” by the farmers who, at least initially, are both intrigued by and fearful of the samurai who they see as not dissimilar to the bandits. Trust and a certain solidarity does develop slowly as the groups work together to fortify the village with moats and a barricade, the farmers are trained in basic combat and preparations are made for the inevitable showdown with their true aggressors. 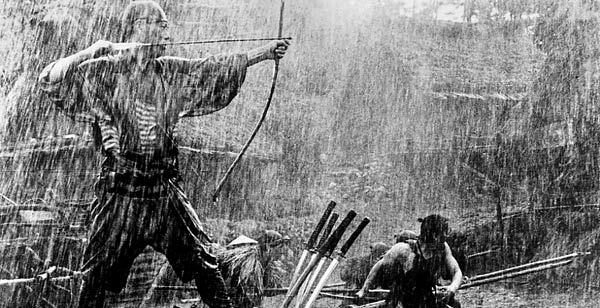 The exhausting, frenetic and bloody decisive battle sequence brings the film to a crescendo and its conclusion; with Kurosawa’s use of multiple cameras put to exceptional use. There are many casualties and whilst one side is victorious the overriding emotion at the end of the film is one of hollowness, rather than jubilation. Have lessons been learned? What does the future hold? What lesson should a contemporary Japanese audience have taken from seeing Kurosawa’s masterpiece? And what does a modern day viewer? Like all truly great films, the director leaves us with more questions than he does answers. Kambei’s topknot is removed and head shaved, leaving onlookers aghast. The narrative’s simplicity makes Seven Samurai accessible to any viewer but this belies the layer upon layer of meaning which Kurosawa’s extraordinary camerawork and mise-en-scène creates, generating a further dimension for analysis and discussion. What we see within the confines of each frame is almost as important as what happens as the plot moves from one scene to the next. Pay particular attention to his use of deep focus – where foreground, middle-ground and background are all in focus – as in this example where Kikuchiyo and Kambei converse, Katsushiro stands at a short distance and behind him we see three of the farmers. Kurosawa leaves it up to a viewer to decide who to focus on. The film is essentially a tale of right and wrong. Its universal themes remain just as applicable now as they were in 1954, or indeed the sixteenth century and its template was used for remakes as The Magnificent Seven (John Sturges – 1960) and even A Bug’s Life by Pixar and John Lasseter in 1998. The moral core of Seven Samurai lives within Kambei. 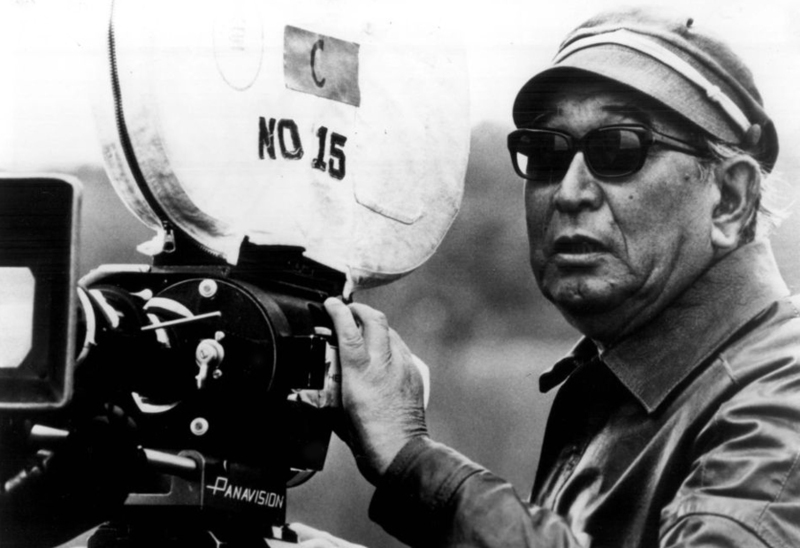 As the film’s principal character and driving force we must also consider that he is Kurosawa’s voice. His introduction shows him to be a man of great humility, bravery and honour. 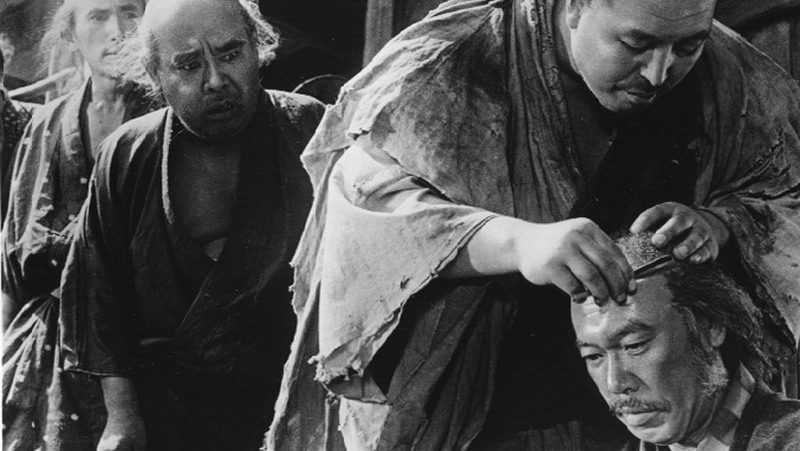 In his analysis of Seven Samurai for Deep Focus Review, Brian Eggert explains that ‘A samurai losing his topknot infers punishment or his induction into priesthood – either way, with no topknot, he no longer remains a samurai.’ As the screen shot above shows, Kambei sacrifices his topknot and his head is shaved. He does so in order to disguise himself as a priest and save a child being held captive by a thief. The thief’s demise is emphasised in slow-motion, a technique used on more than one occasion to underline, but in no way glorify, a significant death. Kurosawa does not romanticise death. There is no glamour to the way men are struck down, fall to the earth in pain and die in the dirt alone. Kambei’s selfless, ingenious act makes him the perfect candidate to lead others by example and it is this influence that recruits five further samurai. You will notice that we are one short. 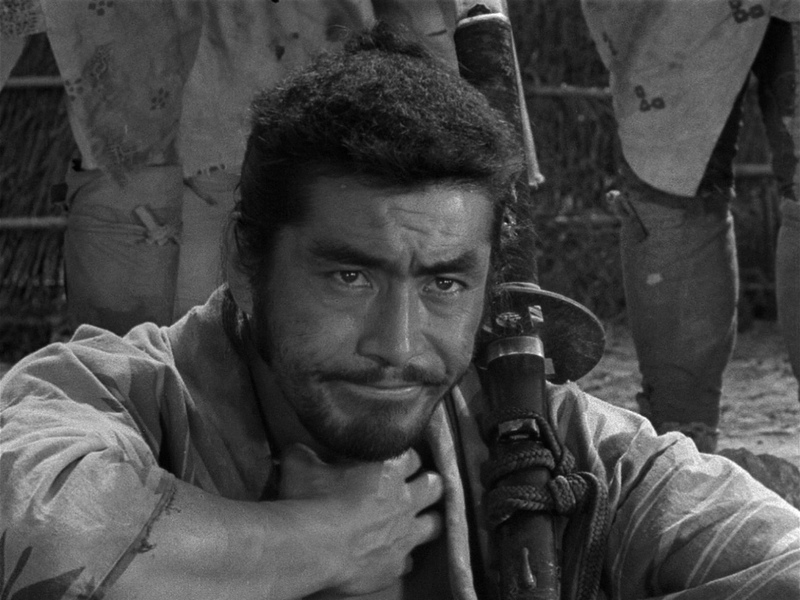 Lucky number seven is Kikuchiyo (Toshiro Mifune). He is the son of a farmer with aspirations as a fearless, somewhat mad and reckless, samurai warrior. In the banner pictured above Kikuchiyo is a triangle, the farmers are represented with one symbol and each of the samurai are a circle; he finds himself stranded somewhere between the two groups. It is certainly no coincidence that when it comes to the final battle Kikuchiyo is put in charge of the bridge. His character is the symbolic connection between two parts of a rigid caste system. Whilst considered by both sides as a drunken loose canon who is not to be taken too seriously, he understands farmers and samurai alike. A practical joke played upon the villagers – by which he sounds the signal alarm, sending them into a frenzied panic – affirms how great their need is for the samurai. Likewise, an impassioned, frustrated speech that he hurls at his fellow fighters demonstrates that the samurai are to blame for the deceitful, conniving way in which the farmers conduct themselves. He is the definition of a bull in a china shop, but a practical bull that prompts introspection and acceptance. Much focus is put on Kambei and Kikuchiyo but the values that the other samurai bring to the film add to its depth of character. Kyuzo (Seiji Miyaguchi) is wise, disciplined and his superior swordsmanship inspires awe and respect in all those who watch him. Heihachi (Minoru Chiaki) and Gorobei (Yoshio Inaba) are amiable characters who find a way to raise morale, whatever the situation. Shichiroji (Daisuke Kato) is loyal to a fault and young Katsushiro (Isao Kimura), although naive and overly idealistic, is principled and determined to live up to his samurai blood. His fleeting romance and brief roll around in the hay with Shino (Keiko Tsushima) adds a Romeo and Juliet-esque romance to what is otherwise a film concentrated on male-dominated conflict. Their star-crossed union comes tinged with sadness, in the knowledge that liaisons between peasant girl and samurai could never work. Monsoon rain falls on the morning of the decisive final battle. The attack ensues as men struggle through the deepening mud, they rush from one end of the village to the other, fighting on their feet, hands, knees – the visceral images tracked from all sides by Kurosawa’s camera. The noise of rain, running water, desperate cries, the wails of petrified onlooking women, the braying of horses and agonised deaths is broken by the cowardly report of two gunshots. Two ignoble deaths and a final act of courage mark the end of the conflict. There are no cheers, only the pitiful weeping of relief, exhaustion and survival. No glory is found in victory here. It is suggested that the farmers, and therefore the Japanese people, only seem to recognise the samurai at times when it suits them, when they are in need. What would happen should they fall prey to bandits again? Could they reasonably expect the samurai, to whom they have turned their backs without a word of gratitude, to come to their aid a second time? As I said before, the ambiguity of the ending Kurosawa’s film leaves room for debate, many threads untied and many questions left unanswered. That is why, sixty years after its initial release, it is still discussed with such reverence and still regarded as one of the finest achievements in the history of filmmaking. Posted in Classics and tagged Akira Kurosawa, Keiko Tshushima, Seven Samurai, Takashi Shimura, Toshiro Mifune, Yukiko Shimazaki.. Bookmark the permalink. This is the nature of war. By protecting others, you save yourself. If you only think of yourself, you’ll only destroy yourself. TRAVEL Top-10 Boston: My favourite American city.